A new project Fighting Sus! brings the youth experience of racialised policing to the fore. In Fighting Sus! a group of young people engage with past struggles against racist state violence and, with angry intelligence and politicised creativity, range themselves against its present manifestations. 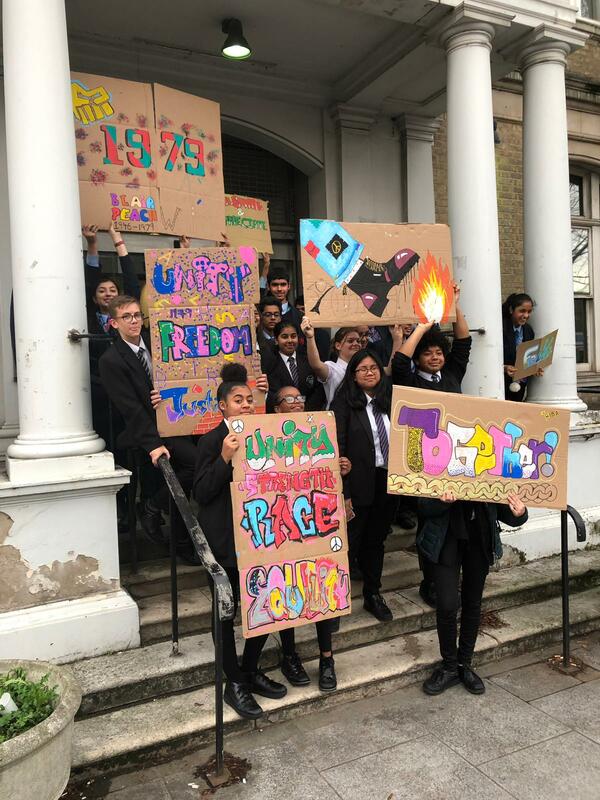 Developed during 2018, this grassroots history project began with a handful of Year 10 students in East London – all from BAME backgrounds– collaborating with oral historian Rosa Kurowska and heritage cooperative On the Record. Their focus on the fight against the ‘sus’ law in the period 1970-81 became an exercise in reparative history, ‘excavating histories of resistance, solidarity and collectivity as vital for the now’. Fighting Sus! is a considerable and timely achievement. The content available for review, accessible online, includes: interviews with community activists who participated in the struggle against sus; a zine, which places the interviews– pictorialised into comic strips by Jon Sack– beside the team’s spoken-word responses to them, along with reproductions of documents and images from the archive; learning resources for an anti-racist curriculum; and a video featuring performances of the poems. 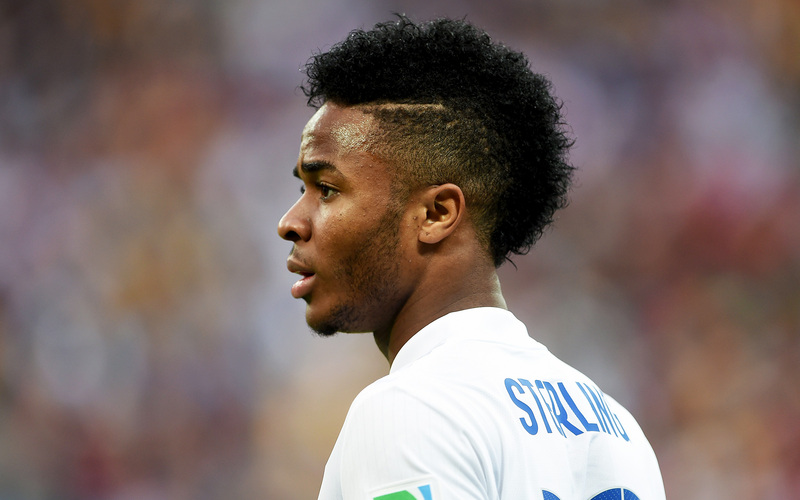 Institutional racism persists two decades on from the Stephen Lawrence Inquiry Report. It still determines who is harassed by the police ‘on suspicion’ and who is not. Racially disproportionate stop and search rates began rising again in 2003 and remain high. What Sivanandan said after Macpherson is as true now: ‘the performance on the ground for the black community is racism as usual’. 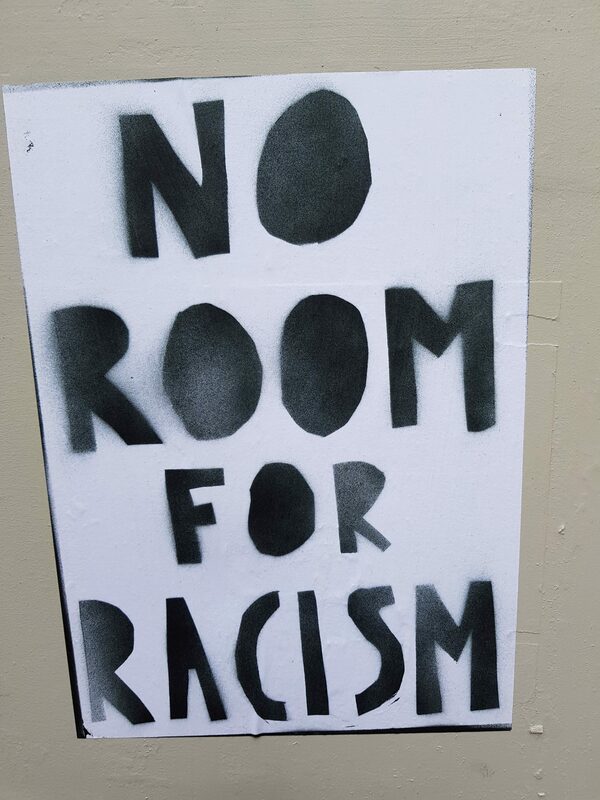 Notwithstanding, the regime of racial neoliberalism has worked to downplay institutional racism even as the targeting and policing of racialised groups has intensified. The substitute, more comfortable notion of ‘unconscious bias’ serves to blank out state racism and, from a historical perspective, disconnects us from past struggles against it. But counter-histories are, and always have been, transmitted along more grounded channels, often in overt contention with official narratives. This is ‘true history’, as understood by Saqif Chowdhury of Fighting Sus! : ‘A history taught us by our mothers, our/fathers, our ancestors/ The truth, the experiences of those around us’. This is ‘the history they want us to forget’, and which Fighting Sus! reactivates. The project is important because BAME youth, though often talked about—as victims or as problems—rarely gain entry to the public sphere as opinionated subjects, despite possessing the clarity born of experience. Even as critical a review of the Criminal Justice System as the 2017 Lammy Review suffers, as Liz Fekete argued, from ‘an absence of the youth voice, or an acknowledgement of their perspectives in their own words’. Fighting Sus! brings the youth voice to the fore. What was sus? Section 4 of the 1824 Vagrancy Act gave police officers the discretionary power to arrest anyone they suspected of loitering with intent to commit an arrestable offence. A survival from a much earlier period of social upheaval, following the mass demobilisation of soldiers after the Napoleonic Wars, it was redeployed intensively from the sixties onward against young black men in Britain. They could be arrested, charged and convicted simply for walking down the street. As the IRR argued in its submission to the Royal Commission on Criminal Procedure in 1979, a sus charge was ‘virtually impossible to rebut’—the subjective word of two police officers sufficed. In the first interview in Fighting Sus!, Hackney activist and poet Hugh Boatswain reflects on his first experience of it: ‘the problem with sus for us was that it was your word versus whoever arrested you’—and it was enough simply to be black and ‘in the wrong place at the wrong time’. Sus was acutely felt in a post-Powell climate of escalating popular racism, ranging from everyday intimidation to ruthless murder. The relationship between the street and the state was clarified during events like the Battle of Lewisham in August 1977. 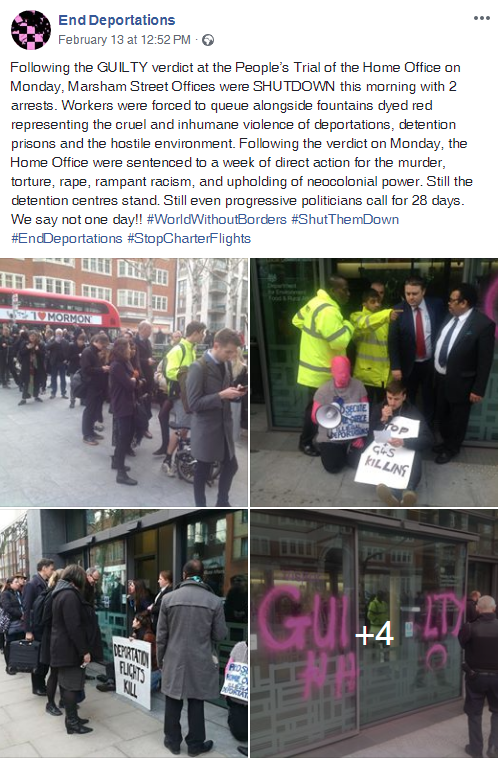 The National Front chose to march through Lewisham because it was a key sight of organised resistance to racist policing, exemplified by the Lewisham 21 campaign. During the march, police protected National Front members but confronted the mixed anti-fascist crowd with cavalry and riot shields (for the first time on mainland Britain). A striking photo from the day is reproduced in the zine. The racial disproportionality of sus arrests in London was well-documented by the late 1970s (see the Runnymede Trust’s 1978 publication, Sus – A Report on the Vagrancy Act 1824). It was a key mechanism in the racialisation of urban space, maintaining the whiteness of certain areas and policing the blackness of others. And it was the latter that became the ‘symbolic’ locations, as 1982-87 Met Police commissioner Kenneth Newman described them, of community self-organisation against police brutality. A movement to ‘scrap sus’ developed through the politicisation of everyday experiences of police antagonism. 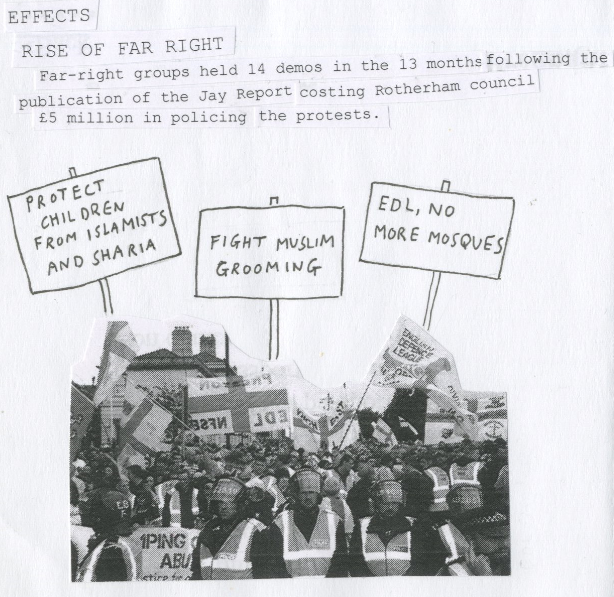 Images and documents from two campaigning groups appear in the zine. In her Fighting Sus! interview, veteran black activist Martha Osamor recalls how black mothers discussed the issue during the school pick-up. They would go on to campaign against it as the Black Parents Movement. The Black People’s Organisations Campaign Against Sus (BPOCAS), a broad coalition of black groups and lawyers, launched later, in 1978. Effective campaigning by BPOCAS and others forced the issue onto the government’s agenda, and by 1980 the Select Committee on Home Affairs would recommend immediate repeal, which was achieved in 1981. The anti-police uprisings of that year, beginning in Brixton on 10 April, gave repeal an added urgency. But this was reform not transformation. In his state-commissioned inquiry into the Brixton uprising, Lord Scarman conceded that the mass sus operation that triggered it, Operation Swamp 81, was ‘unwise’. But he rebuffed the broader accusation that the Met police was institutionally racist. Only a few bad apples tarnished the force’s reputation, he concluded. In ‘Scarman’s Speech’, Jolina Bradley’s poem in Fighting Sus!, a different Scarman is imagined, heralding a more hopeful future. He says: ‘I respect, acknowledge, invite and envision what could be’. But the question remains whether substantive change could ever have come at the instigation of the state. The myth of policing by consent became even less tenable after 1981. Accordingly, Fighting Sus! looks beyond the moment of repeal. 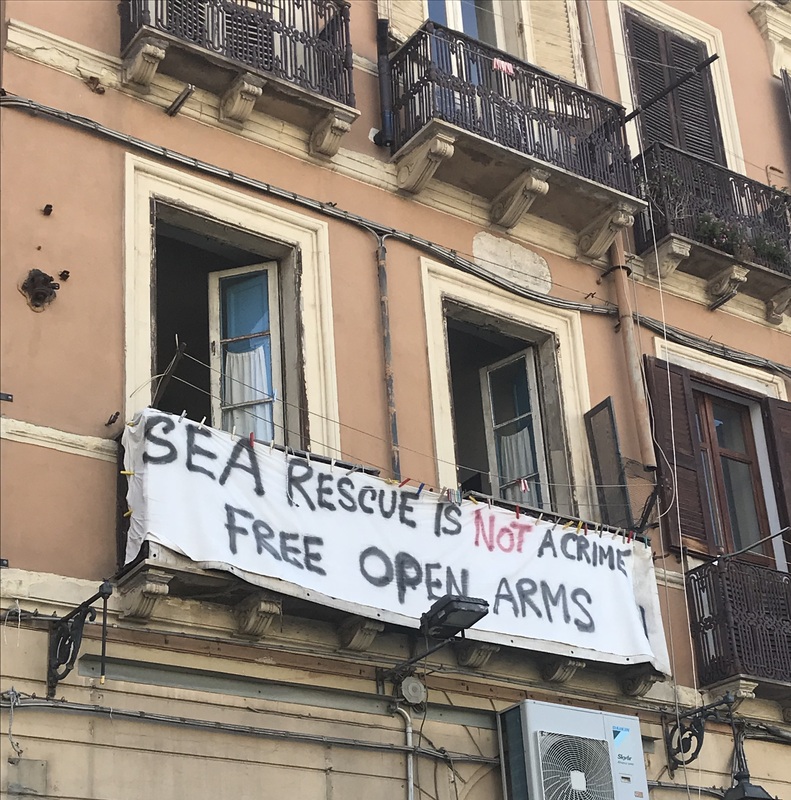 Campaigns against police violence continued—the Fighting Sus! 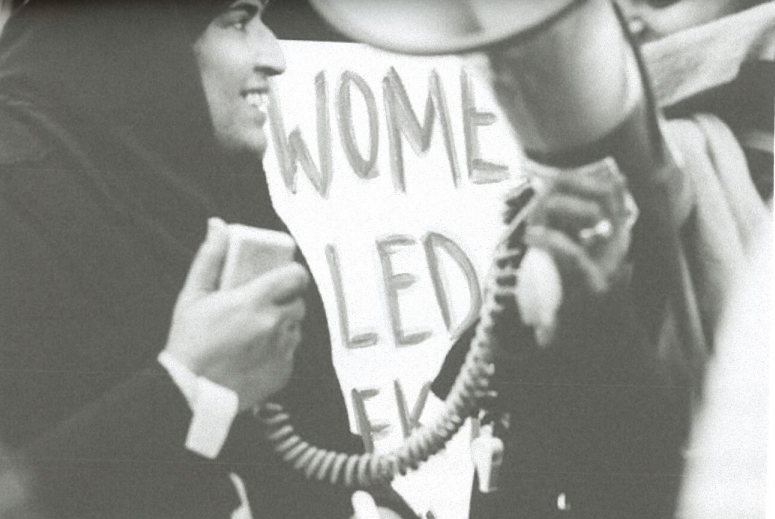 team interviewed Goga Khan, one of the Newham 8 defendants tried in 1983, and the zine contains an image of a Newham 7 demonstration in 1985. England would burn again in that year. As Osamor remarks at the end of her interview: ‘they repealed [sus]. But if you look at the law as it is now, it’s stop and search… It’s still happening’. 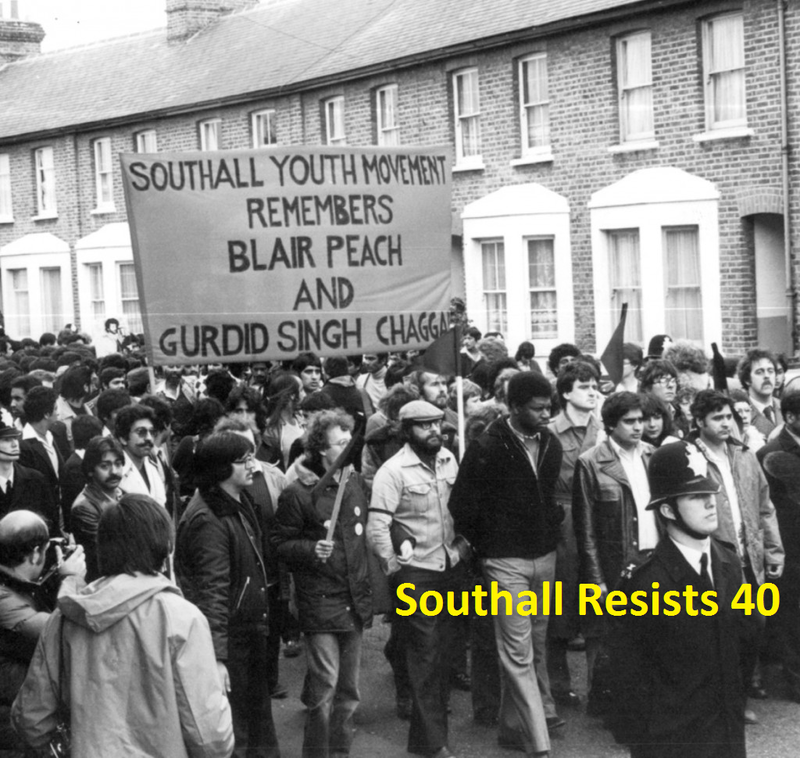 The 1981 Criminal Attempts Act, which repealed sus, was succeeded in 1984 by the Police and Criminal Evidence Act (PACE), which in effect reinstated it as stop and search. The proviso of ‘reasonable suspicion’ was ineffectual. Stop and search was expanded later in Section 60 of the 1994 Criminal Justice and Public Order Act, which introduced targeted emergency powers. In 1999, Macpherson recommended a series of regulatory mechanisms but did not fundamentally question the practice itself. A year later, Section 44 of the Terrorism Act legitimated racially profiled stop and searches. And although it was ruled illegal on human rights grounds in 2010, Section 60 continues to be rolled out. The zine’s introduction wisely suggests that ‘sus may have embedded itself into modern society’, and Liza Akhmetova asks in her poem: “where does it start?/ where does it stop?’ This is Fighting Sus!’s key historical insight: that the policing of suspect communities in Britain is a prevailing logic of social control under racial capitalism, manifest in laws and practices that change over time. The project acknowledges this with the scope of its timeline, which stretches from the original 1824 legislation—and its introduction to the colonies after the formal abolition of slavery—all the way through to the Riots and the Windrush Scandal of our decade. Regimes of race have changed throughout, but always as part of a connected and unfolding racial-colonial history. More than the sum of its products, for those involved Fighting Sus! was a year-long process. Initially, research and discussion, in dialogue with the interviewees. Then the creative responses—in music, spoken word and other forms—which were performed in nine venues across London during Black History Month. There was also the production of the 45-minute film, the zine, and the teaching materials for schools. Practical workshops were held along the way, for example, on stop and search rights with Adam Elliott-Cooper. Altogether, this would have been an educative, creative and collective experience. The forging of solidarity through the project is clear in the all-women group performances of ‘Mangrove 9’ (01:17) and ‘Verbatim’ (34:05) in the film. However, most of the poems still contain distinct individual perspectives. Brandon Leon and Jessica Lima understand sus as a ‘prison out of prison’, part of a web of control. Memuna Rashid’s poem ‘The System’ begins similarly but turns towards struggle and the freedom dreams that sustain it. 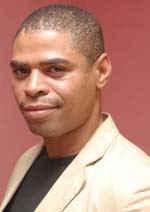 And a harder vision of the future can be found in Rotimi Skyers’ poem, which invokes the flames of past uprisings, but scaled-up to a revolutionary vision of the end of the world as we know it: ‘and if the whole world burns, for us to come in from the cold,/ then let the whole world burn’. Fighting Sus! gathers a previous generation’s history and a new generation’s hope, despair and rage in one place. Thanks to the team, an archive dedicated to sus, the first of its kind, now exists at the Bishopsgate Institute. The project invites other young people to explore this and related histories for themselves, to create their own archives and develop responses to them. The zine’s back matter lists key archives for further research—including the IRR’s own Black History Collection—and includes the details of some organisations—Y-Stop, Stopwatch and Release—where information, advice and political involvement can be sought. More projects like this need to be funded and realised. Visit the Fighting Sus! website or order a copy of the publication by emailing On the Record. Twenty-one months on from the disaster that was visited on their community, Grenfell people still wait for justice. 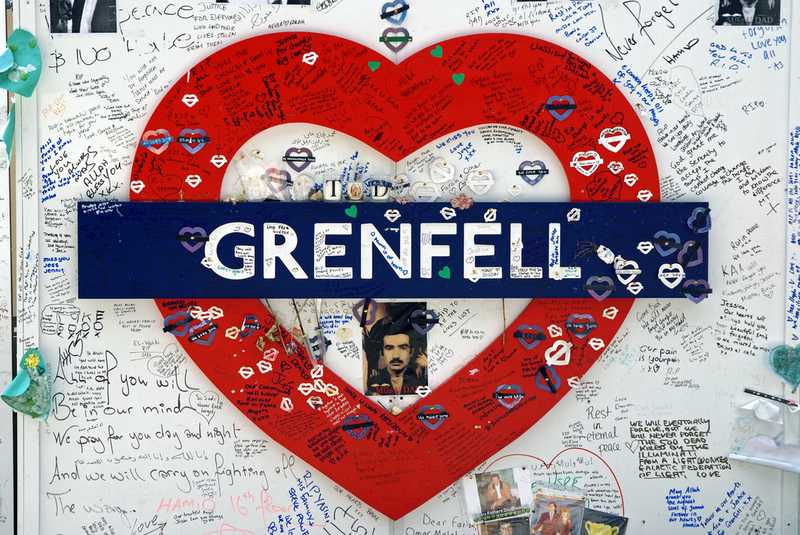 On 13 March 2019 the Equality and Human Rights Commission (EHRC) released a report on Grenfell. [i] The findings and recommendations are being submitted to the Government’s Grenfell Public Inquiry in regard to the 14 June 2017, west London, Grenfell residential tower fire in which seventy-two people perished. Earlier last month, the Metropolitan Police admitted that no prosecutions would be likely until the public inquiry has reported its findings and recommendations – although at its inception in 2017, it was indicated that it was already possible to see grounds for prosecutions to be brought. Meanwhile the Public Inquiry’s Phase 1 hearings, concerned with exactly what happened on 14 June 2017, were completed in December 2018. The report from those Phase 1 hearings, chaired by Judge Sir Martin Moore-Bick, is not yet delivered. And the Public Inquiry’s Phase 2 hearings, to examine the circumstances and causes of the fire (original design and construction; subsequent modifications; fire safety advice and prevention; communication with residents) are due to commence in 2020. And the Public Inquiry is expected to complete its work in 2022. Given the slow progress of the Public Inquiry, and the fact that human rights and equalities concerns belong properly to its Phase 2 hearings – the EHRC’s submission is timely. 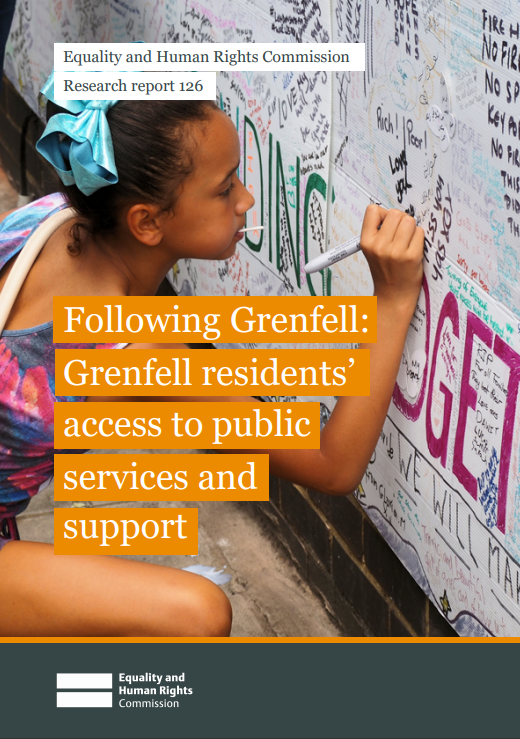 The EHRC reported on its investigations in regard to Grenfell residents’ access to services and support in the period before and after the 2017 fire. 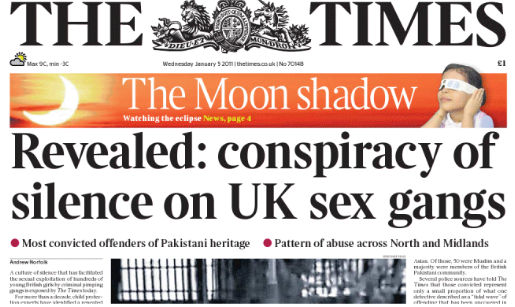 And, in a bold and politically sensitive move, it chose to hold the public launch of its findings and recommendations at the Muslim Cultural Heritage Centre in west London – in the neighbourhood of the tower. Highlighting an urgent need for ‘duty of accountability’ public sector training, the EHRC reported that overall it had found a degree of ‘institutional inadequacy’ in regard to communicating and sympathising with those most affected by the Grenfell disaster. The investigation found, for example, that the local Roma gypsy community, mostly overlooked in media coverage about the Grenfell neighbourhood, could obtain no assistance with clearance of the litter of burnt debris covering its site, in the wake of the fire. Just so, the EHRC notes, as many others have done, that the Public Inquiry itself has been convened geographically too far away from the Grenfell locality! Sifting through the evidence gathered by Race on the Agenda (ROTA)[ii] along with that emanating from the Public Inquiry hearings, the EHRC investigated matters specifically related to both ‘the right to life’ and ‘equality rights’. It found evidence of serious breaches to the right to life – for which see the coroner’s report to the Public Inquiry in relation to improper use of cladding, lack of proper evacuation procedures, poor high-rise fire-fighting training, poor advice to residents – all of which demonstrate past, and continuing, breaches of the right to life. What’s more, the EHRC has concerns as to whether the duty to investigate potential risks to the right to life has been complied with. And, in terms of equality rights, the EHRC found violations of the public sector duty in regard to the rights of the vulnerable, women, the disabled, and children – where ‘minority ethnic’ groups made up the majority of the residents in the Grenfell tower. Looking to the continuing process of the Public Inquiry, the EHRC representatives stressed a concern that right to life and equalities matters would in all likelihood not be picked up in the Phase 2 hearings. And, in conclusion, they stressed the need for urgent attention in regard to changes to buildings legislation, adequacy of information to residents, lack of regulatory systems, remedial works, fire-fighting training, systemic failure – affecting a large number of now existing sites around the UK. In the Q&A with which the event ended, local activists appeared to be under-impressed. The tone of their questions – so what now? where is the focus on power-inequality in these human rights concerns? can ‘independent’ organisations like the EHRC please give some explicit guidance and specific action support? – hardly disguised the fact that they would like to see considerably more militancy added to the need for urgency that is acknowledged in the the EHRC’s report. The platform speakers came up with judicious responses – (a) keep up the campaigning, (b) try to effect change in public sector practices by using the electoral system, (c) take legal advice and action. 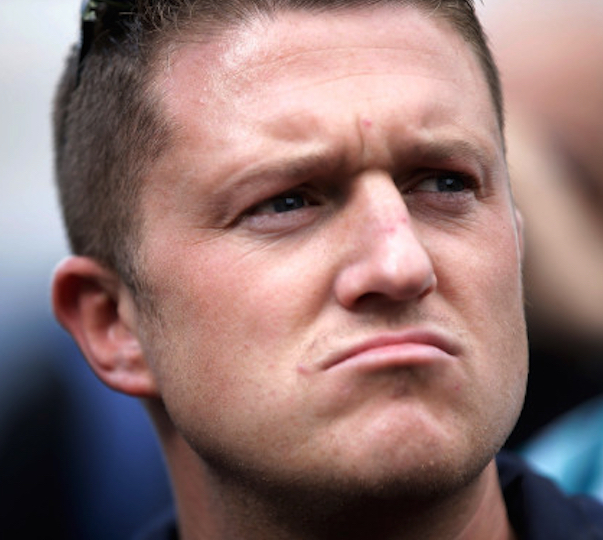 26 March: In Vienna, police raid the home of Martin Sellner, head of the Austrian Identitarian Movement, as part of an investigation into possible ties with the Christchurch killer flagged up by a ‘disproportionately high donation’ from a person named Tarrant. The extreme right Freedom Party is also being investigated for its ties to the Identitarian Movement. (Guardian, 26 March 2019; The Local, 30 March 2019). 29 March: It is revealed that two policemen from the German state of Baden-Württemberg were members of the far-right Uniter group, which was founded by a former Bundeswehr sergeant. (Spiegel, 29 March). 19 March: The far-right Forum for Democracy makes strong gains in Dutch provincial elections, capturing 13 seats in the Senate. FvD leader Thierry Baudet blames the Utrecht shooting, in which three people died, on the government’s migration policies, describing the attack by a Turkish-born man as ‘half-terrorist’ and half ‘honour killing’. (Politica.eu, 19 March 2019). 24 March: Twitter and Youtube are criticised for providing a platform to Steve Stone, one of the hosts of far-right Radio Aryan, which is thought to be based in Wales and is described by Hope not Hate as ‘a platform for British Nazis’. Twitter deleted Stone’s account and Youtube only after being contacted by the Sunday Times. (The Sunday Times, 24 March 2019; Gob Online, 24 March 2019). This calendar was compiled by Joseph Maggs with help from Graeme Atkinson, Jamie Wates and the IRR News Team. 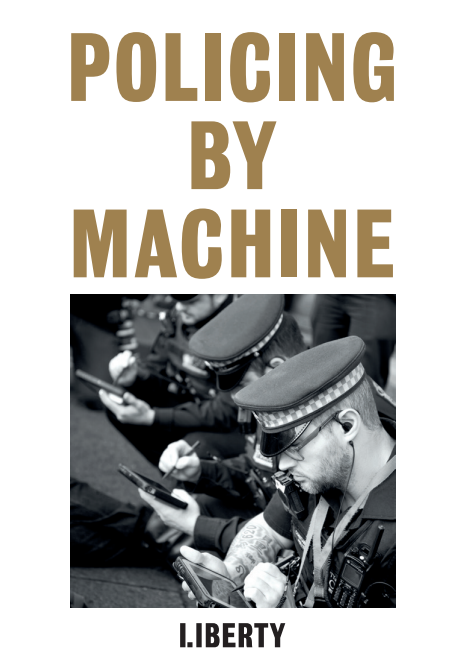 ‘Today, a new form of corporate colonisation is taking place’, argues Michael Kwet, ‘Instead of the conquest of land, Big tech corporations are colonising digital technology’. Kwet, a Visiting Fellow at Yale Law School, reveals in a path-breaking article, with South Africa as an example, how the US is reinventing colonialism by exerting structural control of the tech ecosystem, leading to perpetual resource extraction and US economic and cultural dominance in the global South. And as US multinationals exercise imperial control of the digital world, flows of securitisation also travel via geopolitical relationships. Chandni Desai and Heather Sykes, faculty members at the University of Toronto, trace the flow of securitisations between Israel and Brazil, showing how Israeli companies use Gaza as a ‘lab’ to develop weapons, policing techniques and security technologies that is then sold at the Olympics to police the favelas. The way that favela communities in Rio were perceived and violently policed during the 2016 Olympics resonates with Alan MacLeod’s timely article on how western media represents Venezuelan chavista supporters (who are mainly working-class black communities) as dangerous ‘gangs’, hoards or mobs. As Jair Bolsonaro was embraced by Israel’s prime minister Benjamin Netanyahu at the presidential swearing-in ceremony in 2018, revealing the deepened relations between the two rightwing leaders, Desai and Sykes also highlight the ‘the unique forms of solidarity from Brazil to Palestine’, through which global struggles against the policing and militarisation of oppressed communities are being strengthened. The massacre of fifty Muslim worshipers, and wounding of fifty more people, at the Al Noor mosque and Linwood Islamic Centre in Christchurch, New Zealand, streamed live on Facebook via the gunman’s body camera, has left Muslims scared and angry. Angry because they could see it coming, yet their fears were talked down. Scared because in today’s climate it seems virtually impossible to trust those in power to stop creating the conditions for even more Islamophobia. Islamophobia is the breeding ground for racism and fascism in Europe today, and anti-Muslim racism has more than one face. It is institutional (enshrined, since September 11 and the war on terror, in a punitive criminal justice system that singles Muslims out for greater punishment and enhanced surveillance); it is electoral (witness the Conservative Party campaign against Sadiq Khan in the 2016 London mayoral election or more recently, in Italy, with the League electioneering on the slogan ‘Stop Invasion’ and the promise to close down mosques). Islamophobia is legally sanctioned by the state (many European countries have deprivation of citizenship laws targeting Muslims, also restricting the wearing of the burqa and the hijab); it is popular (note the British media’s obsessional referencing of ‘on-street grooming’ as a specific Muslim crime and the fashionable Muslim-bashing in mainstream debates). And all this inevitably leads to attacks on Muslim places of worship and racist violence on the streets. 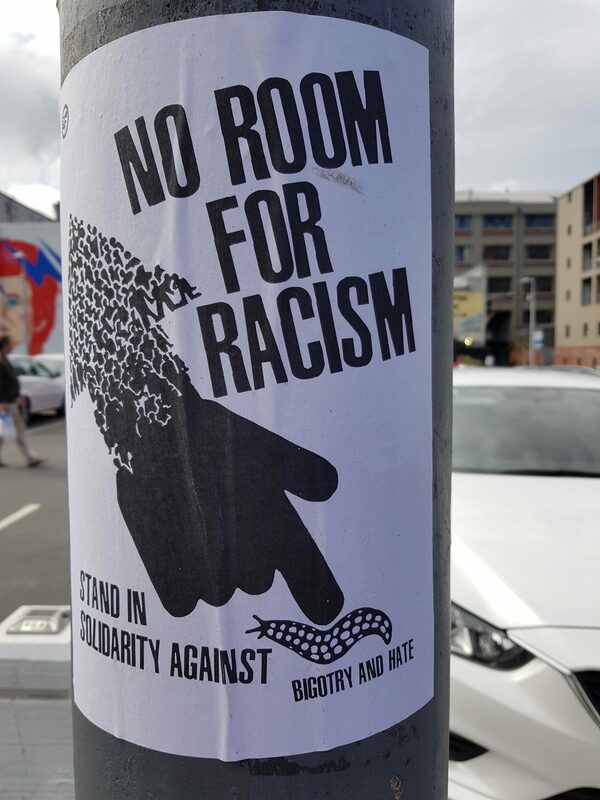 A poster put up in Wellington, New Zealand, after the attack. Muslims, then, are feeling vulnerable because though the massacre may have happened nearly 12,000 miles away, it felt very close. Exactly how close was made manifest in the UK in the immediate aftermath, in the number of attacks on Muslims, including the abuse of a taxi driver in Rochdale, attacks on Muslim worshippers in Whitechapel and Finsbury Park, and what police are describing as a Christchurch-inspired ‘terrorism-related’ incident in Stanwell, Surrey, where a teenager was stabbed by a man dressed all in green (ie, camouflage gear) and wearing a balaclava, shouting, according to one witness, ‘kill all Muslims’ and ‘white supremacy rules’. (Read a full list of attacks here). 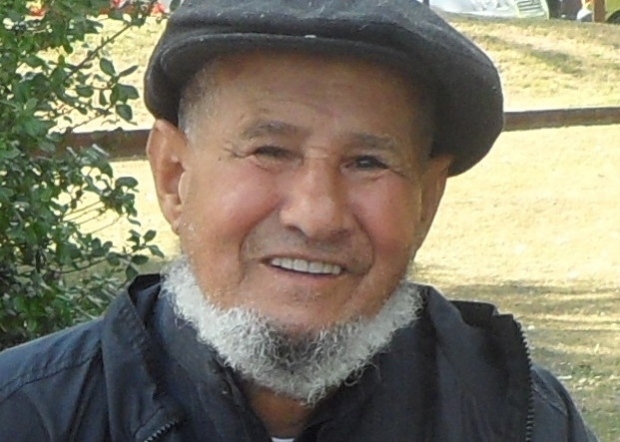 The first thing to say of the perpetrator of the Christchurch massacre is that he considered himself a partisan in a war – a war against Muslims. He refers to himself, in the 74-page document he sent by email to thirty New Zealand politicians including prime minister Jacinda Ardern minutes before the massacre, as a ‘freedom fighter’, an ‘ethno soldier’ taking a stand against ‘ethnic and cultural genocide’. Dressed in military fatigues, the gunman listened on his car radio to a song idolising the genocidal war criminal Radovan Karadzic, as he pumped himself up, like a paramilitary mercenary, to carry out the murders. Inscribed on his ammunition were the names of other perpetrators of racist crimes, including Luca Traini (responsible for the drive-by shootings of African migrants in Macerta, Italy, in 2018), far-right prisoners (Spanish neo-Nazi and ex-soldier Josué Estébanez who killed a 16-year-old anti-fascist in 2007), individuals and places synonymous with white supremacist narratives about dangerous Muslims (Rotherham) and the names of historical Crusade figures of the Middle Ages who fought Muslim armies. 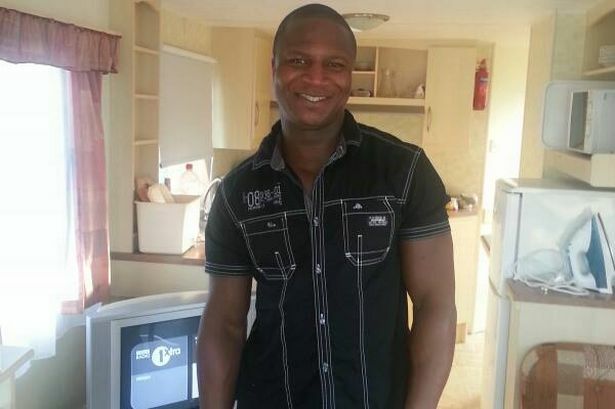 The second thing to say about the alleged perpetrator is that he might be Australian by nationality, but by identity he is European – Scottish, Irish and English’ by ‘stock’, is his own self-description. Certainly his white supremacist fantasies come in European shades. 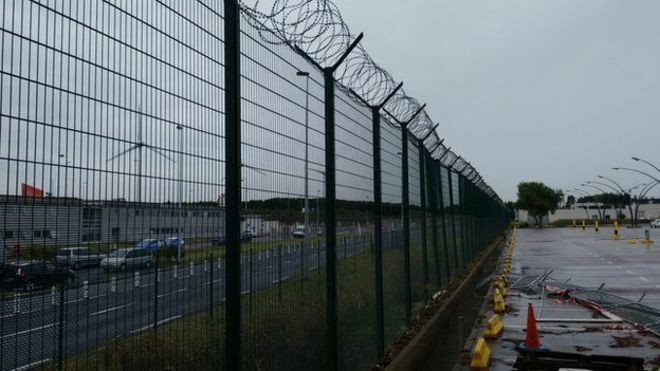 Such was his attachment to the European ‘motherland’ that he travelled in 2016 and 2017 through France, Portugal and Spain, Bulgaria and Hungary, describing in his ‘manifesto’ the ‘fuming rage and suffocating despair’ he felt against the invaders, claiming that French people were ‘often in a minority themselves’. But to use his term, manifesto, to describe his 74-page document is to flatter him. It would give respectability to the incoherent scribblings of an unadulterated white supremacist and arrested adolescent obsessed with ‘sub-replacement fertility’, civilisational decline, decay and death. 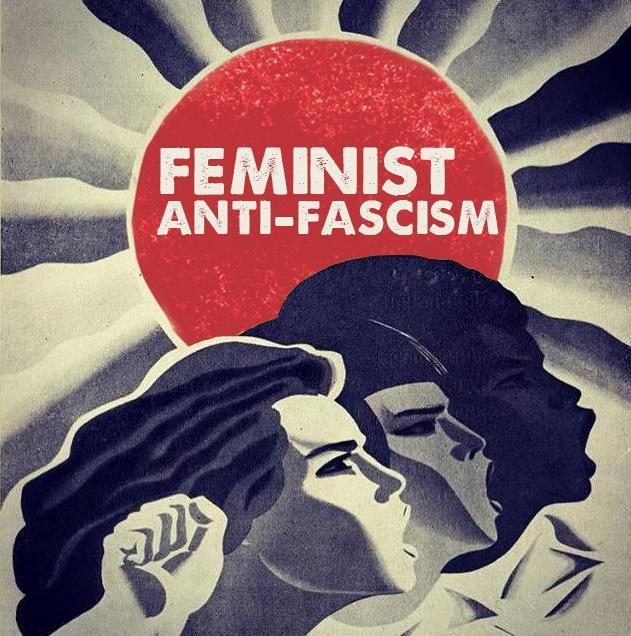 Everything in the manifesto is redolent of the deluded narrative of white victimhood and white martyrdom that is everyday exchange in far-right chat rooms and online subculture. It conveys no thought-out ideas, only the self-pity of a 28-year-old man who compares himself to Nelson Mandela and expects, in his own delusional words, to one day win the Nobel Peace Prize. The Norwegian mass murderer, Anders Behring Breivik, who also described himself in military terms (his manifesto was signed AB Justiciar Knight Commander, cell 8 Knights Templar, Europe), said much the same in his manifesto, further claiming, at a pre-trial court appearance, that he should be honoured with a military medal for his actions. But in all the debate since Christchurch, one category of people has not been called to account as it should be. In the gunman’s journey through racism and hate he greedily gobbled up any pseudo-intellectual titbit thrown his way by a coterie of New Right writers and journalists who have stretched the limits of public debate and made racism respectable under cover of cultural critique. First, the title of his manifesto, The Great Replacement: Towards A New Society, is taken from the FN- and PEGIDA-sympathising French writer Renaud Camus, who in 2012, echoing the Eurabia theme of Bat Ye-or (‘Europe is being colonised by the Arab world and forced into an attitude of dhimmitude’), coined the term le grand remplacement to describe the colonisation of France by Muslim immigrants from North Africa and the Middle East. This process, through changing demographics, replaces an existing culture with a new one, and threatens to ‘mutate’ the country and its culture permanently. In the UK, there was outrage when the BBC invited a leading member of Generation Identity (a movement that originated in France) onto the ‘Newsnight ’ TV programme to discuss the causes of the Christchurch massacre. Generation Identity is a movement that has its roots in France, where New Right authors like Renaud Camus, Eric Zemmour, Jean Raspail and philospher Alain Finkielkraut have dominated the broadcast and print media for at least a decade. When challenged, the high-minded and apparently well-mannered Camus took to Twitter to deny accusations that he provided the intellectual inspiration for the killer, opining that this ‘criminal, idiotic, and awful’ attack was carried out by a perpetrator who is guilty of an ‘abusive use of a phrase that is not his and that he plainly does not understand’. Camus’ words, so elitist and insensitive, make it all the easier to understand Guardian columnist Nesrine Malik’s declaration that she’s ‘done with debating racism after Christchurch’. Malik’s point is that the fork-tongued ‘genre of response protocol’ that follows attacks on Muslims, which ‘blows dog whistles even as carnage is unfolding’, makes it ‘futile’. In his 1,500-page manifesto, Breivik, now serving a 21-year prison sentence that can be extended indefinitely, made a number of references to New Zealand, in particular suggesting that it might be a place for Europeans to move to in order to avoid immigration. It’s worth recalling that after Breivik was arrested, the mainstream media sought to present him as a disturbed loner, denying that the mass murder of seventy-seven people, mostly children, could be racially or politically motivated. (Let’s not forget that the children he killed were attending a Norwegian Labour party youth summer camp.) Initial psychiatric assessors, who had no knowledge of the universe of ideas that Breivik was part of or the hyper-reality he had joined on the internet, assessed him as suffering from paranoia and delusional fantasies, failing to recognise the ideological roots of his violence and the intellectual currents that nurtured him. Thankfully that view was challenged and overturned. Today we must stop the mainstream media similarly erasing the roots of the terrorist’s Islamophobia, recognising also that at a time when the extreme Right is represented in nearly every European parliament, the rhetoric of war has become normalised. The idea that European civilisation is threatened by Muslims and by immigration is part of mainstream European political thought. 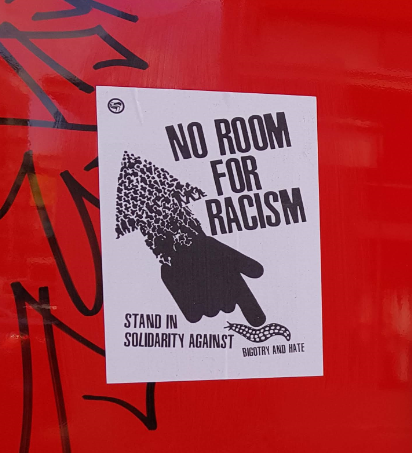 In the UK our struggle is not just against the far Right but the wider culture and politics that provide it with intellectual ammunition and space. Liz Fekete is author of Europe’s Fault Lines: racism and the rise of the Right. Order a copy here. The terrible events in Christchurch, New Zealand, which left fifty people dead and fifty people injured, reverberated across the UK. 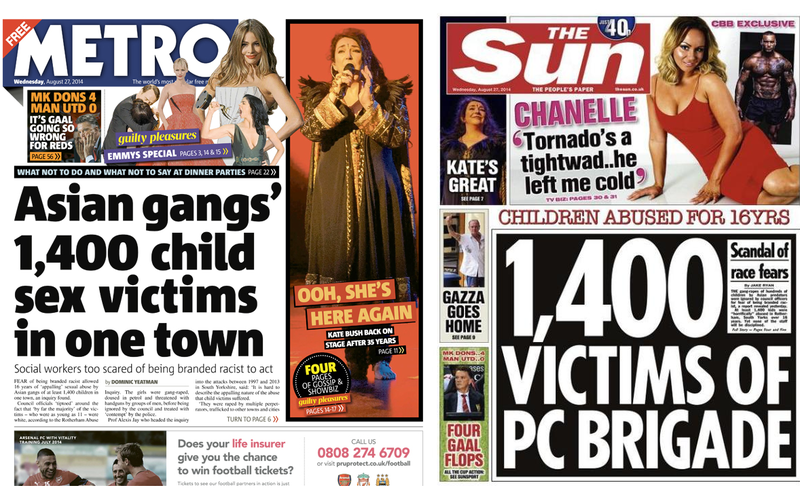 Below we provide a round-up of the most important developments, drawing particular attention to criticism of the media, online posts in support of the perpetrator and attacks on Muslims across the UK. We also draw attention to the European dimension. An additional calendar on the Christchurch massacre of fifty people in New Zealand, its European implications, and related racial violence in the UK can be found here. 13 March: Amnesty International publishes Pushed to the Edge: Violence and abuse against refugees and migrants along the Balkans Route. It accuses European governments, which fund Croatian police, of complicity with its vicious assaults as well as the practice of collective expulsions whereby thousands of asylum seekers are left trapped in two small Bosnian towns near the Croatian border, where a humanitarian crisis looms. (Amnesty International, 13 March 2019) Read the report here. 11 March: West Midlands Police call in the Independent Office of Police Conduct to investigate the events of a viral video clip showing a group of police officers violently restraining an apparently Muslim man. The force reveals the incident took place on 25 February, after a doctor called the police during a mental health assessment at a patient’s home. (Independent, 10 March 2019; Birmingham Mail, 11 March 2019). 16 March: Munich police announce that thirteen police officers from the Support Commando unit (USK) are suspended and under investigation for sharing anti-Semitic and right-wing extremist content over social messaging services. (Deutsche Welle, 16 March 2019). More Christchurch-related violence and harassment documented here. The Tamil community has lost a valiant fighter. Just one year after the passing of A. Sivanandan (Siva), the Tamil community suffered another devastating loss with the sudden death of human rights activist and community organiser Vairamuttu Varadakumar. Friends found him at his home last week, after he uncharacteristically had failed to attend several engagements. Varadakumar (or ‘Varada’ to his friends and colleagues) was the long-time Executive Secretary of the London-based Tamil Information Centre (TIC), an independent community-based human rights organisation focussing mostly on the two largest minorities in Sri Lanka: Tamils and Muslims. TIC has, for the best part of four decades, fought racist and imperialist government policies – whether deportations of asylum seekers; the proscribing of the LTTE (‘Tamil Tigers’); or the use of the British SAS and some elements of its police undertaking training of a variety of oppressive Sri Lankan state forces. Varadakumar came from the village of Manipay in Jaffna, the cultural capital of the Tamil North-East of Sri Lanka. After fleeing the emerging civil war, he arrived in the UK in the early 1980s and thrust himself into the urgent task of assisting fleeing Tamil refugees at the still-fledgling TIC. The organisation was instrumental in researching and documenting some of the most important and accurate stories and testimonies. Today, TIC is in possession of thousands of precious and original materials in its archives – a special responsibility given the destruction of the Jaffna Library in 1981 at the hands of a government-inspired Sinhalese mob. 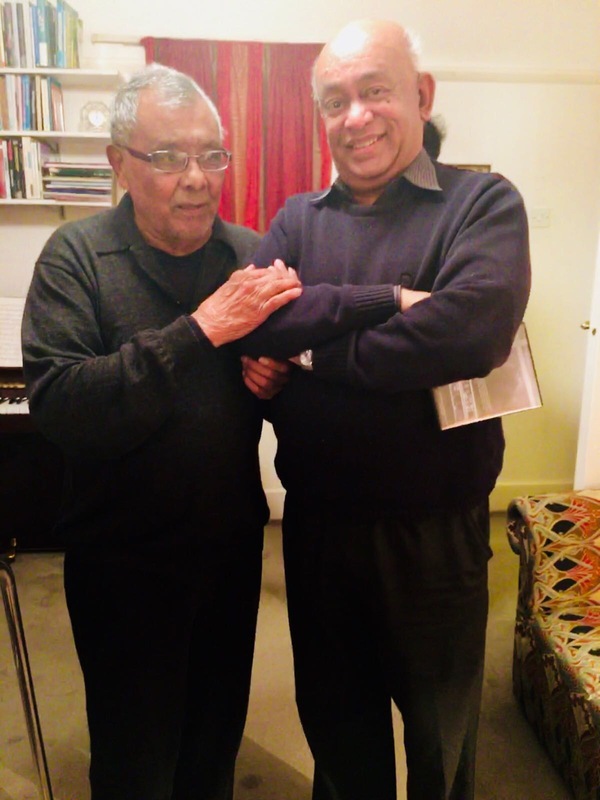 In December 2015 TIC, with Varadakumar the driving force, gave Siva an award for his ‘dedicated contribution to civil rights and championing economic justice’ at its annual Human Rights Day community event in Merton, South London. When Siva passed away in January 2018, Varadakumar penned a lengthy tribute with some personal memories, reflections and observations. The admiration was reciprocated when Siva bequeathed his invaluable archive of books on imperialism, India and the Tamil struggle and Ceylonese/Sri Lankan history to TIC. These volumes will be known as the Sivanandan Collection, as part of TIC’s library in its Kingston-based premises. This event will now also become a space for celebrating him and what he has built at TIC and an opportunity to affirm our determination to continue his life’s work so as to truly honour his legacy. But to make it happen, the event still needs support.Please consider donating to the exhibition fundraising platform: gofundme.com/tamils-of-ilankai-museum. The ‘Tamils of Eelam: A Timeless Heritage’ exhibition will take place on the weekend of May 18-19 in Tolworth Recreation Centre, Fuller’s way North, Surbiton KT6 7LQ. Entry is free. This calendar was compiled by the IRR News Team with the help of Zeeshan Ali, Graeme Atkinson, Joseph Maggs and Jamie Wates. 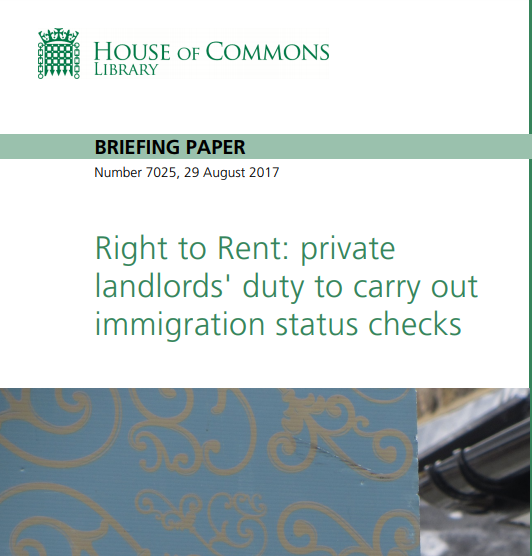 New IRR publication provides a fresh take on housing, policing and racism in London. The moral panic over supposedly dangerous black, urban subcultures in London, emerges at a crucial time, argues the Institute of Race Relations (IRR) in a challenging background paper published today. The impact of financialisation on local authority housing is converging with location-specific intensive and intrusive policing. In The London Clearances: Race Housing and Policing, researcher Jessica Perera traces the overlap between attempts to gentrify so-called ‘sink estates’ and the criminalising of young black men, seen as an obstacle to such ‘regeneration’. 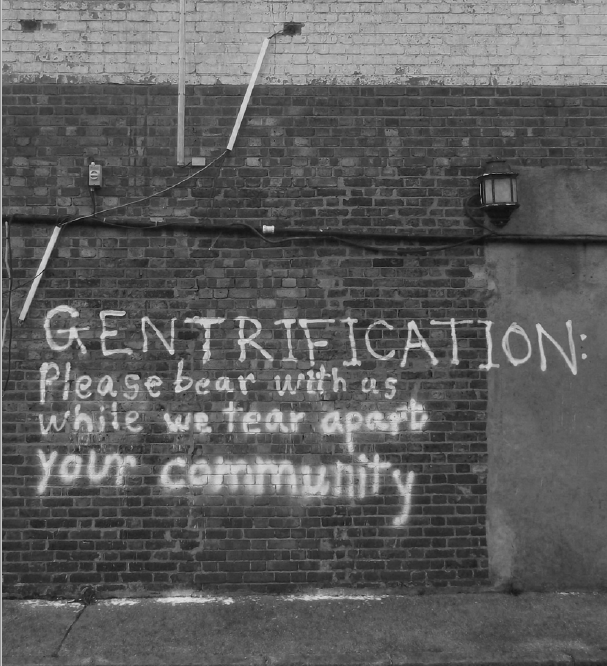 She provides historical context to understand the current moment, analysing not just the Estates Regeneration Programme of the current Conservative government, but the ‘positive gentrification’ policies of New Labour, as well as its creation of ‘ASBO Britain’. There are thousands of people waiting for housing across the capital, and yet new housing developments are not being built to meet their needs. Instead, the report reveals how ‘regeneration’ projects are being used to actively dispossess working-class and low-income families of their homes. This process, often referred to as ‘social cleansing’, has previously been understood as a class issue. But the fact that BAME families are over-represented in social housing in the capital and highly racialised language was used to describe London’s post-war housing estates in the aftermath of the 2011 riots, would strongly suggest, the IRR argues, that this is also a race issue. IRR researcher Jessica Perera says, ‘this is a replication of the government’s “hostile environment” policy. 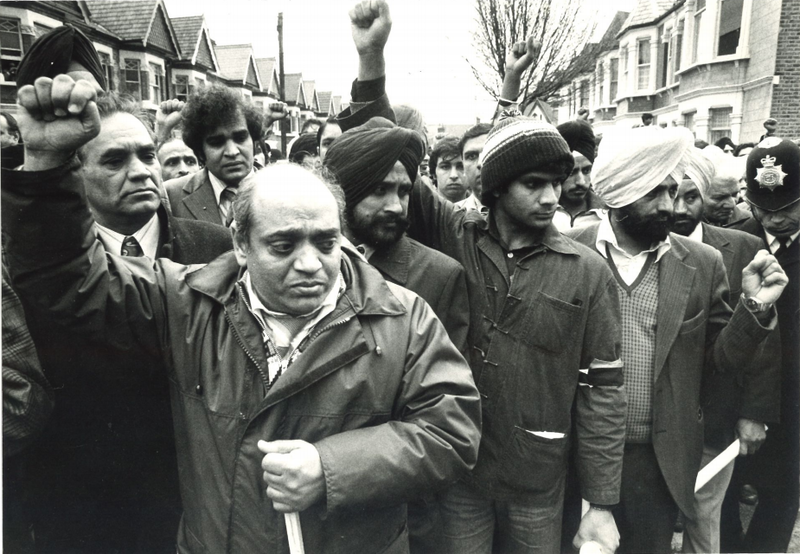 Instead of the policy being a prelude to moving people out of the country, it is, at a local level, a prelude to decanting BAME families from local authority land.’ For Perera such localised hostile environments, administered by a range of state institutions (local authorities, housing associations, social services, schools, police) denotes the way policing in London today is being organised around the project of regenerating London and, in turn, gentrifying it. 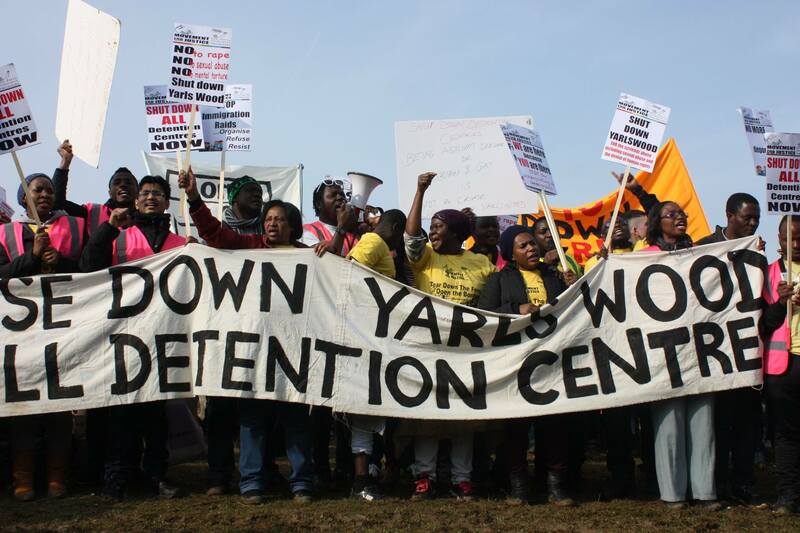 A lecture examining political resistance to the UK’s ‘deport now, appeal later policy’, the value of direct action and what the judgement on the Stansted 15 means for the future of political dissent. 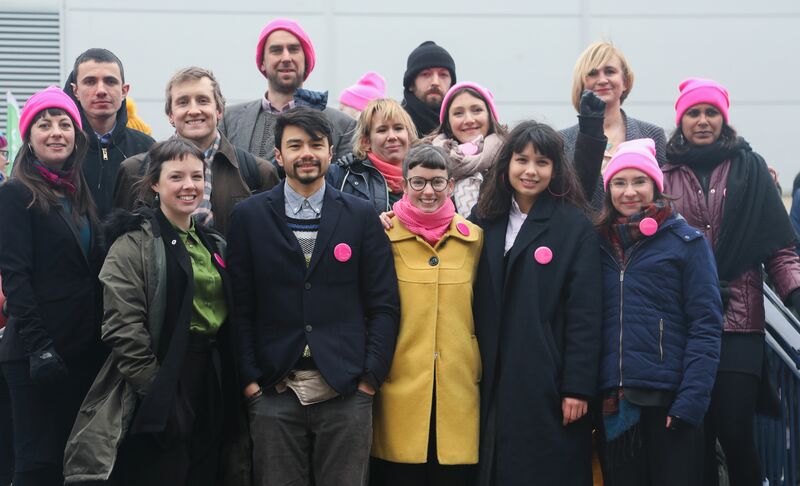 The event, hosted by the International State Crime Initiative, will feature Ali Tamlit and Helen Brewer – two members of the Stansted 15 – their legal counsel, and experts on policing and protest. A London conference bringing together activists from across Europe and beyond to discuss and organise against the rise of the far Right. 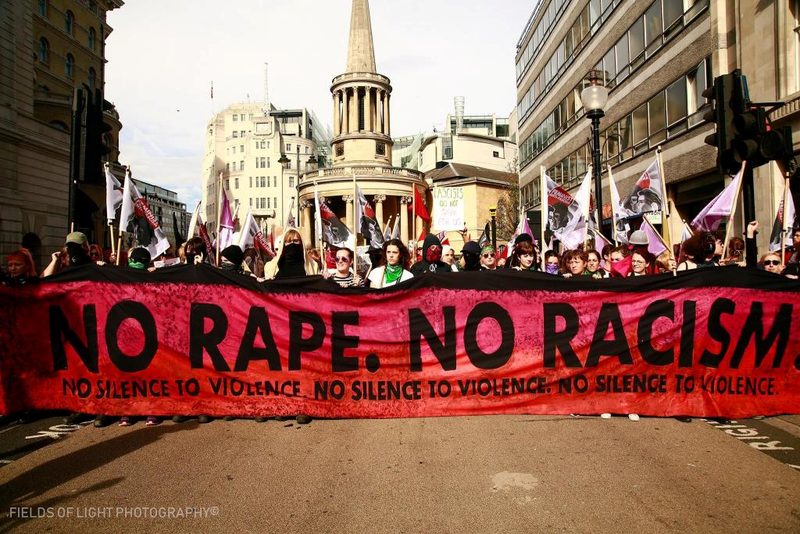 Speakers include Diane Abbott MP, Liz Fekete, and more. The first day of the trial of the Stansted 15. 31 January: The chair of the All-Party Parliamentary Group on Knife Crime says that a government proposal, to amend the offensive weapons bill to introduce ASBO-style knife crime prevention orders, risks criminalising a whole generation of young people. (Guardian, 31 January 2019). This calendar was compiled by the IRR News Team with the help of Zeeshan Ali, Graeme Atkinson, Odysseas Grammatikakis, Joseph Maggs and Jamie Wates.